Last Call’s Alleged Lesbian Activities ensemble. Photo: Erin Roussel. This podcast is part of the Creating Place project. View the full multimedia collection here. In this podcast, members of queer performance collective Last Call discuss creating multi-generational queer space and the creation process for Alleged Lesbian Activities, a community performance event eulogizing New Orleans dyke bar culture. Last Call is a multiracial collective of queer artists, activists, and archivists in New Orleans, LA. 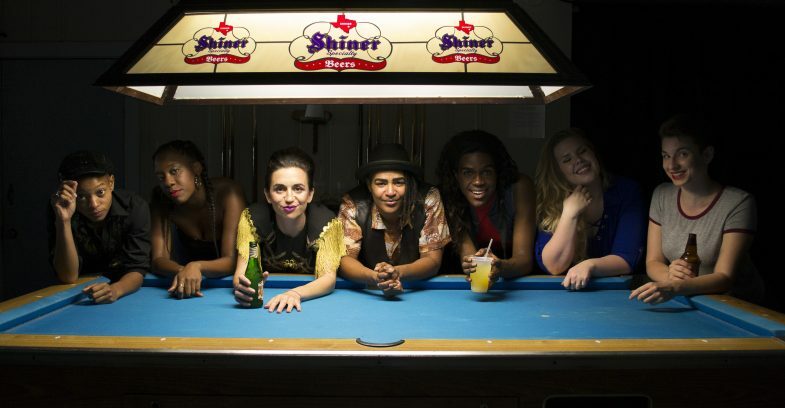 Drawn together by the closing of the last remaining dyke bar, Last Call creates innovative, multi-platform performances, events, and digital media that document and interpret neglected queer history, creating connections between those who lived this history and those who have much at stake if it is forgotten. They conjure up intergenerational gathering places where the movement for queer liberation is carried forward. Last Call was founded by Rachel Lee, Sara Pic, and Bonnie Gabel and is Co-Directed by Bonnie Gabel and indee mitchell. For more information on Last Call and Alleged Lesbian Activities or to listen to the Last Call podcast visit www.lastcallnola.org. This episode of Creating Place features conversations with Rachel Lee, Erin Roussel, indee mitchell, and Shanelle Mills, interviews and recording by Bonnie Gabel and Erin Roussel. Editing, music, and soundscaping by free feral, with additional support from Hannah Pepper-Cunningham. The project is supervised by Nicole Gurgel-Seefeldt. Funding for Creating Place: The Art of Equitable Community Building comes from the National Endowment for the Arts’ Our Town program.